— A mother. A daughter. Three possible dads. And a trip down the aisle you'll never forget! ABBA's greatest hits are woven into a sunny tale set on a Greek island. On the eve of her wedding, a bride's quest to discover her father's identity brings three men from her mother's past back to the place they last visited 20 years ago. 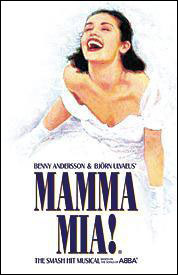 What Is Mamma Mia! Like? Calling all ABBA fans, this has your name written all over it. The songs are all culled from the Swedish super-group’s songbook, and this is one Broadway show where singing along (and dancing in the aisles) is encouraged. Is Mamma Mia! Good for Kids? Linzi Hateley on 'Traumatic' Carrie Memories, Not Vacationing in Greece & Returning to the West End in Mamma Mia! Newcomer Gabriella Williams, Mazz Murray & More Will Join West End's Mamma Mia!